"Mars One is not just a daring project, but the core of what drives human spirit towards exploration of the unknown. We are privileged to be a supporter of this incredible project," said Dan Petrovic, general director of Dejan SEO. Mars One aims to launch a series of robotic missions between 2016 and 2020 that will build a habitable outpost on the Red Planet. The first four astronauts will set foot on Mars in 2023, and more will arrive every two years after that. There are no plans to return these pioneers to Earth. Company officials say they've talked to a variety of private spaceflight firms around the world and have secured at least one supplier for every major piece of the Mars colony mission. The corporate sponsorship money will be used mostly to fund the conceptual design studies provided by the aerospace suppliers, each of which require 500 to 2,500 man-hours to complete, officials said. Mars One estimates that it will cost about $6 billion to put the first four humans on the Red Planet. The company hopes the "Big Brother"-style reality show will pay most of these costs. 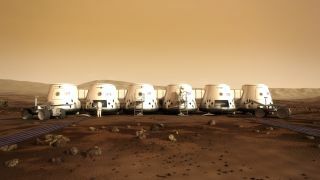 The televised action is slated to begin in 2013, when Mars One begins the process of selecting its 40-person astronaut corps.